Cox is co-author of the 2016 book How the World Breaks: Life in Catastrophe’s Path, from the Caribbean to Siberia. He is research coordinator at The Land Institute. He co-wrote the piece “A Rising Tide: Miami is sinking beneath the sea — but not without a fight” for The New Republic. He said today: “The way we ‘develop’ a place is part of the problem. 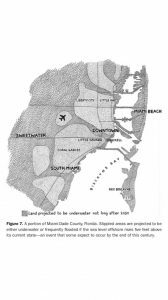 Some economic stimulus is adding fuel to the fire, this is true for Miami because of its extraordinary vulnerability to sea level rise, as well as other parts of Florida. For decades, we’ve been building in places that should have remained as ecological buffers. Irma is showing that with the intensity of hurricanes being pumped up by greenhouse warming, threats are not just to places like Tampa, but to inland areas many thought were safe, like Orlando. “In the immediate aftermath of such disasters, economists and Goldman Sachs types always tell us not to worry, that our economy is so big and resilient that the city or state that endured the disaster will quickly recover and return to its growth trajectory. In fact, we’re told, disasters provide economic stimulus: the construction and remodeling industries boom; car sales rise. “We are already hearing this about Harvey, and will hear it even about Irma and the devastation it wreaked on an entire state. “This idea — that in large economies, disasters of any size or ferocity can easily be folded into the cost of doing business — is a dangerous one. “It ignores the toll in human misery that can never be undone by economic growth. “It can lead people, including policymakers, to conclude that climate change won’t be such a big deal, that if we fail to rein in greenhouse emissions, we can just ride out the disasters that ensue. “It fails to consider whose economy is going to recover and be just fine. The benefits of the economic stimulus will go to the top of the economy, where they always go. People and communities who were barely making ends meet before the disaster will find it difficult or impossible to recover. Cox wrote about the impacts of development in Naples in a previous book, Losing Our Cool.